Don't know about an ingredient? Today I will give you a Pavakkai recipe for preparing a dish with bitter and sour taste. Its a typical Kerala dish which our old grandmothers used to prepare and serve with boiled rice. The new generation may not have tasted this. Mothers are also hesitant to prepare this kaypakka curry because of the bitter taste. But if you prepare it well (with no /little bitter taste), even children will love this dish. Add 3 tea spoon coconut oil to the frying pan (If you have a manchatti / clay pot, it will be more tastier. Add vertically sliced (approximately 2″ length) bitter gourd pieces. Add the sliced onion pieces, garlic cloves, salt, turmeric powder and saute well and warm the ingredients. Pour water, saute and cover the lid and allow bitter gourd to become soft. In another frying pan add coriander powder, red chilly powder, fenugreek powder and fry till changes color. Make #5 into a paste in a mixer and add it to the bitter gourd mixture. Heat oil in small frying pan/kadai, splutter mustard seeds. Add dried red chillies, thinly sliced onions and curry leaves when the mustard starts crackling and saute. Add #9 to the bitter gourd mixture; mix well and cover the dish. Keep it aside for 10-20 minutes. 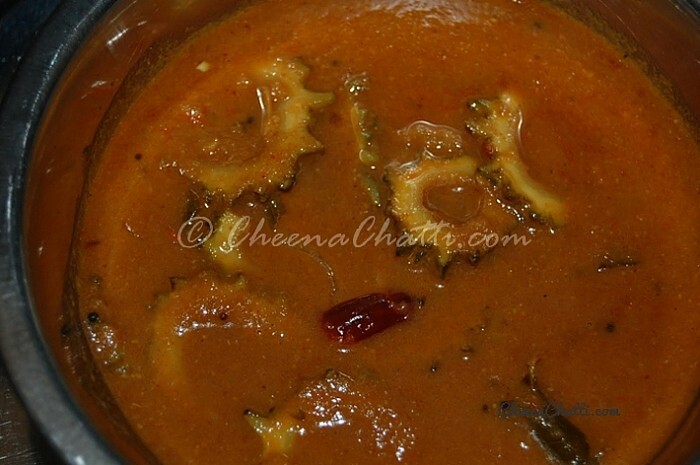 This entry was added on February 25th, 2013 by Renoos in Gravies and Curries and tagged with bitter guard, kerala food recipe, kaypakka curry, vegetarian, pavakka curry recipe, pulicurry, bitterguard curry, bitter gourd, kerala curry. Last revised on March 31st, 2018. Recipe & Recipe photo contributed by Seethalakshmi N.
I made this curry…it came out well..thanks for this recipe..
@Tina: Thanks for stopping by and trying the recipe. Glad to hear it came out well for you..